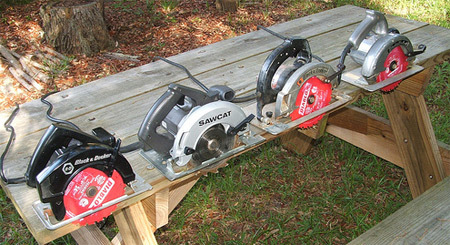 Here’s a great lineup of older Black & Decker sidewinder saws from reader PutnamEco. Generally I love any circ-saw, but I’m fascinated with older ones. PutnamEco lists out what each one is and they’re all interesting — but the one that caught my eye was the Super Sawcat. Black & Decker circular saws from my collection. The closest saw in black is an 7 1/4″ 1 1/2 HP saw from early 80s?, no model is listed on the tag, the grey saw is an model no. 3057 Sawcat from the late 70s, a poser living on the reputation of the next saw with the black handle, a real Super Sawcat cat. no 997 from the late 60s, last a cat. no. 730 aluminum bodied saw from the early 60s. Mostly because the 60’s were before my time, I haven’t gotten my hands on one but once. It was the first circular saw I ever held. It was a thing of mystery at the time but it kicked off a lifelong love of all things noisy and dangerous. Glad to see they are not as rare as I thought they were. Nice circ’ collection, sir! I am very impressed by the bit of history that this lineup conveys. I don’t think that I would be able to do anything near the same with tools in my inventory – do have a super sawcat – but not anything to surround it. Maybe I look at my Rockwell PC sanders, planes or routers. I have the gray one, still work after 25 years, mine is from the 80’s, a 3060 Professional Saw Cat , I think, first saw I bought. I don’t know how rare you thought they are, but IMHO they are very rare. They seem to sell for around $500 on the auction websites. Impossible to get parts for as well. I don’t think that I would be able to do anything near the same with tools in my inventory. Just luck that I could do that. I don’t believe I have any other progressions of tools from one manufacture like this line up of saws. When I started out I mainly relied on B&D since I had a great local hardware store/lumber yard that had a good selection. I have to admit that I’m a bit of a tool junkie, and tend to hold onto well built or interesting tools. Since I usually have a couple few tools as backups some have stuck around the shop for ages. After B&D went downhill, I used a lot of Milwaukee tools, but I don’t have more then a couple of generations of their tools. Now I’m a lot less brand loyal, picking the tool that I find is the best for the job at hand. The model 3057 Sawcat, shown second from the left, was actually produced starting in 1991, not the late 70’s as mentioned above. It was the entry level professional saw in a brand new new lineup of Sawcats and Super Sawcats being offered by B&D that year. Compared to the other Sawcats of the early 90’s, the 3057’s shoe was made of stamped steel as opposed to extruded aluminum, it had a 2 wire cord set instead of grounded 3 wire, and had a slightly less powerful 13 amp motor (1840 MWO vs 2075 MWO). The basic design of the 3057 was carried on into the DeWalt saws such as the DW359 produced up until around 2001. While I appreciate the #3057 saw, the most desirable versions of the ’90s Sawcat lineup are the #3060, which looks exactly similar to the #3057 but with the addition of the electric brake, and the Super Sawcat #3064. The black saw is a model 7308 from at least the summer of 1983 up through about 1987, intended for light-duty or occasional use around the house. The other Sawcat in your collection was the first Super Sawcat model produced, dating between 1965-69. This is the only saw in your collection with an electric brake (like all Super Sawcats). The oldest saw dates from before 1961-62. I have just received, as a gift, a Super Sawcat 8 1/4 in. The number is 2695, Type 1. Serial #19600. This saw was from an estate sale. I don’t think it has been used that much. Does anyone have any information on this saw? What you have is the largest of the Super SAWCATs ever produced. Yours is from around 1991 (and thus likely the first of that generation) given its type number and serial number. It was also sold by DeWalt as the DW384. Like all Super SAWCATs it has an electric brake which allows the blade to stop on a dime when you let go of the trigger. I have a B&D No. 63, type 1, Cat. 63, ac/dc circ saw. It still runs ok, but I can’t tighten the blade. There is nothing to hold the motor shaft from turning in order to tighten the bolt holding the blade. Can anyone tell me how to tighten the blade. I found this saw with the steel case and adjustable fence next to a garbage dumpster. I have two of the old Super Sawcats, a 7 1/4″ and an 8 1/4″. With both saws you have to jam the blade into a piece of lumber and while pushing the blade down into the wood tighten the blade bolt. I found out the hard way that you MUST use at least 12 gauge high quality extension cords with the electric brake models or the armature commutator will burn prematurely, 10 gauge if your over 75-100’of cord.